When Leah and I started comparing notes and brainstorming cohesive designs for Great Northern, she was a bit surprised that I found inspiration in the character and wardrobe of Norma. I’ll be speaking more in a few weeks about why I like Norma so much, but for now I just wanted to touch on one of the patterns I’ve drawn from her. The working name for this one is Norma’s Henley; she’s one of the characters who’s often dressed in some classy, vintage threads. 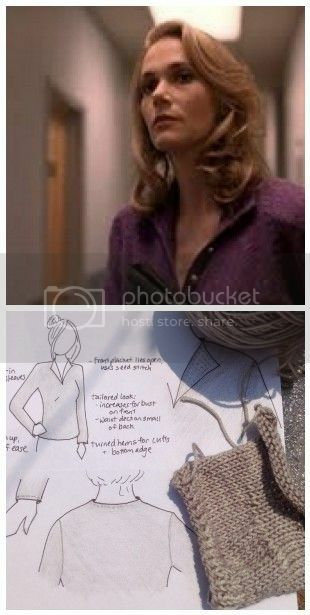 One scene in particular caught my eye: she’s wearing a great, structured pullover that has the classic lines and shape of a Henley. This type of top was quite popular in the 1970s, an era of fashion that I’m particularly fond of, and remains a basic in many wardrobes today. I wanted to take the enduring modern tradition of the Henley and remake it for the contemporary knitter. This sweater will be the sort of thing that you’ll wear for many years to come, with flattering shaping details for the waist and bust, long set-in sleeves, and delicate neckline detail. Want to keep up to date on all things Great Northern? Just sign up for the newsletter here.